Freehand annotations that were added using Papers 3 for iOS are now synched and displayed on Papers 3 for Mac! 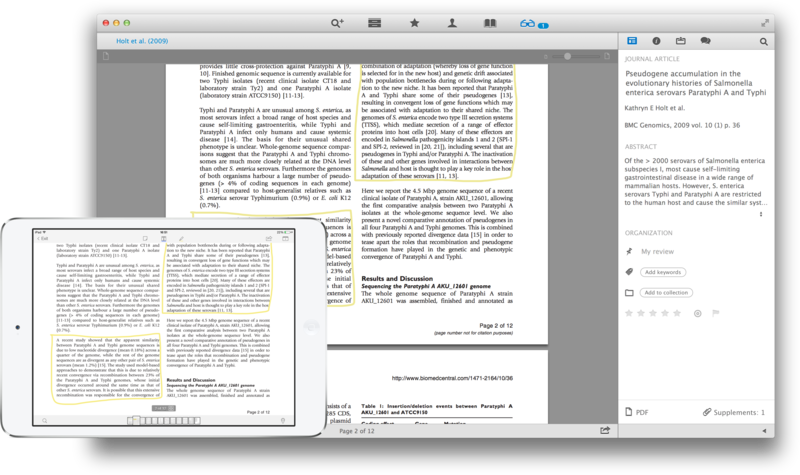 (Freehand annotation editing on Papers 3 for Mac will be added in a future update). Dragging one or more papers from your library into a note annotation will now add the citekey references to that note. set author names of first item of selectedPapers to "Griekspoor, A.C.; Neefjes, J.J.; Groothuis, T.A.M." Adds support for exporting PMCIDs during a BibTeX export operation. Addresses several causes of crashes when using OS X 10.10 Yosemite Developer Preview and Beta releases (specifically when viewing PDFs, and a crash on launch in DP6). Citations can now be inserted into supported apps when using OS X 10.10 Yosemite Developer Preview and Beta releases. The Citations on/off switch in the preferences panel is now labelled correctly when running the app on OS X 10.10 Yosemite. Addresses an issue that could occur when tokenizing keywords in the Federated Search when running the app on OS X 10.10 Yosemite. Further performance & stability improvements to the new patch-based syncing engine. Addresses a crash that could occur when interacting with collections in the sidebar. Addresses a rare crash that could occur if a items in a Papers Online collection had missing keywords. Addresses a bug which meant some common document identifiers (PMID, DOI, arXiv ID, ISBN) were not automatically detected when using the Federated Search. Fixed an issue where Papers couldn't split a string of multiple author names by the semicolon character. Fixed an issue where if the "Suggested matches" popover was dismissed without matching, outdated results would be displayed the next time the popover was used with a different paper. Addresses a rare bug that causes the library to collapse to a very small window. Re-enables metadata parsing in the Preview frame. When running on OS X 10.10 Developer Preview 6 or later, automatically scrolling to a specific annotation on a paper using the sidebar inspector will instead scroll to the top of the page that the annotation is on (manually scrolling to annotations is still possible as a workaround). Please read our article about using Papers 3 for Mac with the recent Mac OS X Yosemite public beta release - there are some known issues, and therefore careful consideration should be given before installing Mac OS X Yosemite if Papers 3 for Mac is critical to your workflow.